Here are hundreds of free Futoshiki puzzles suitable for printing. Futoshiki (不等式) (also known as More or Less or Unequal or Hutosiki) are logic puzzles from Japan. The name means inequality. They are similar to Comparison Sudoku puzzles. The objective is to fill the grid with numbers so that each row and column is filled with unique digits. The < and > symbols provide additional clues that show you the relationship between adjacent squares. My Futoshiki puzzles are available in 6 sizes. Each volume contains 100 printable booklets. Within each volume, the books are ordered by ascending difficulty -- so Book 1 contains very easy puzzles, and Book 100 contains very difficult puzzles. 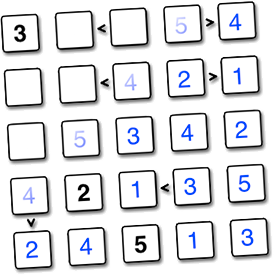 Sizes 4 through 6 contain sixteen puzzles, and sizes 7 through 9 contain 9 puzzles per booklet. Note that the larger puzzles are more difficult. These smaller puzzles are easier -- I suggest starting with them if you haven't tried Futoshiki before.. Note that as the sizes get larger, the difficulty increases. These are no longer the largest size I publish. See below! These puzzles are large print, 1-per-page. These are the largest Futoshiki puzzles I publish.